Sandvik Coromant completes its New Insert Generation with the introduction of GC4205, the first choice new insert grade for steel turning at high speeds and high metal removal rates under stable conditions. The new insert grades have an extended performance range, from roughing to medium and semi-finishing, and withstands operations where high cutting temperatures are generated. The application area of GC4205 insert grades is across the P01-P10 area. 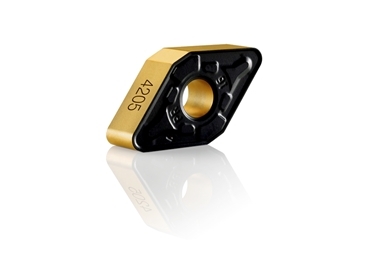 These insert grades can work with high hardness materials (HB>270), with a high cutting speed (Vc >250 m/min), high metal removal rate and long time in cut. At high cutting data, GC4205 insert grades are able to produce 30 per cent more parts than a competitor grade, due to better crater wear and plastic deformation resistance.